I appreciate your interest in my dye work - I enjoy doing all of them! I dyed this piece by hand in NJ, U.S.A.... and I have been doing so for many years. As with all of my designs, this is one of a kind. I don't mass-produce or pump 'em out! This "Quasar" design is a powerful piece with many little things going on in it! It has subtle shades of Grays as well, which adds to the depth of the design. Like most of my Tie-Dyes, the more you look at it, the more images you'll discover - often, different people see different images. 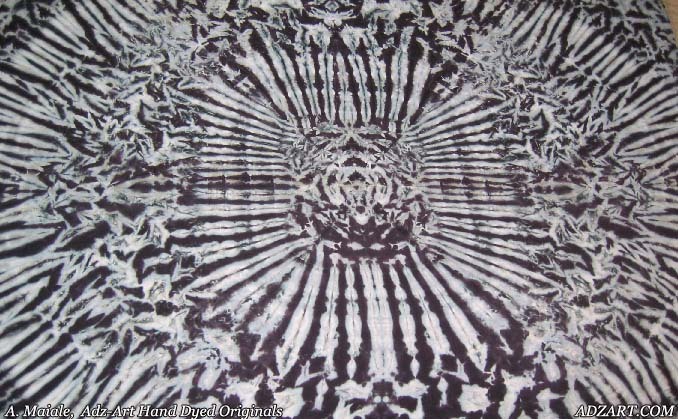 Although I have a lot of control of the dyeing process, there is always unexpected things happening which make each one special & unique - this is what has kept me interested in developing & fine-tuning my tie-dye art over the years, and folks like to have something that no one else can possibly have. The material is a soft & sturdy 100% Rayon which dyes up really well and has a little sheen to it, and it has an especially GREAT FLOW to it. This piece is all finished with hemmed sides. It works well as a Wall Hanging, a Throw for on a bed or sofa, and these are often used as Sarongs or Wraps for women for beach or even a more formal event. This "Quasar" wall hanging will be a great addition and add a BLAST of drama to any room - whether you are a hippy or just a person who likes interesting art. Each piece is already washed several times, so that no bleeding of the dye will ever occur. Any future washing: cold water, hanging dry is best. I use professional high-quality dyes which don't fade, even after many washes. I guarantee years of satisfaction & vibrant colors! Enjoy more of my artwork at www.adzart.com ! Feel free to contact me if you have any questions or comments. Shipping: I use U.S. Post Office 2-3 Day Priority Mail for a quick delivery, $5 to anywhere in the U.S., International Shipping is $11. There's NO Charge for handling! Returns: If necessary, I will give a full refund within 7 days (less shipping cost). The piece must be in the same condition as you received it.